I love Halloween. I love dressing up. I love getting the house all “decked out” for a night of family-friendly fun. I’m not much into getting scared. 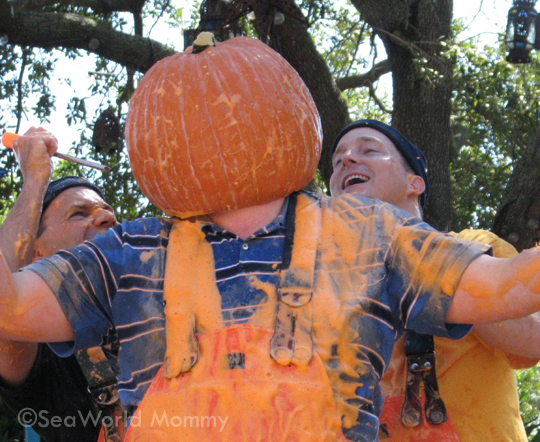 For me, SeaWorld’s Halloween Spooktacular is right up my alley, and is one of the most fun events of the year. It seems to get better and better all the time. 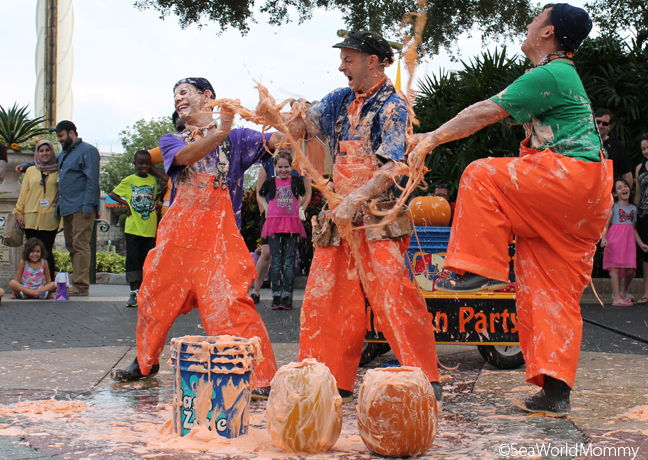 Starting October 4, SeaWorld’s Halloween Spooktacular takes place from 12 to 8 p.m. October: 4-5, 11-12, 18-19 and 25-26. 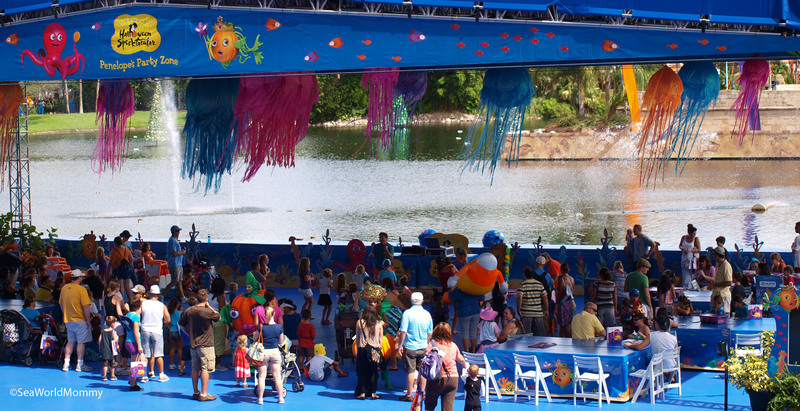 New this year is a Dine With Shamu Halloween Spooktacular Brunch. In what’s being called “an immersive and memorable brunch experience,” families will enjoy a seasonal menu while being up close and personal with SeaWorld’s majestic killer whales. Plus, Halloween surprises are promised including a family photo with a Spooktacular frame, a free cookie decorating kit (something my 7-year-old loves! ), and a trick-or-treat bag with goodies. This year’s candy line-up in “Waves of Trick-or-Treat Fun” includes Tootsie Rolls, jelly beans, Airheads… just to name a few. The great fun is not only in getting to indulge in lots of yummy treats (aka “sometimes foods in our house, LOL), but stopping by all the themed characters and stop points. There is SO much to see. near the underwater viewing side of Shamu Stadium. Make sure you check out Penelope’s Party Zone over in the Bayside area. 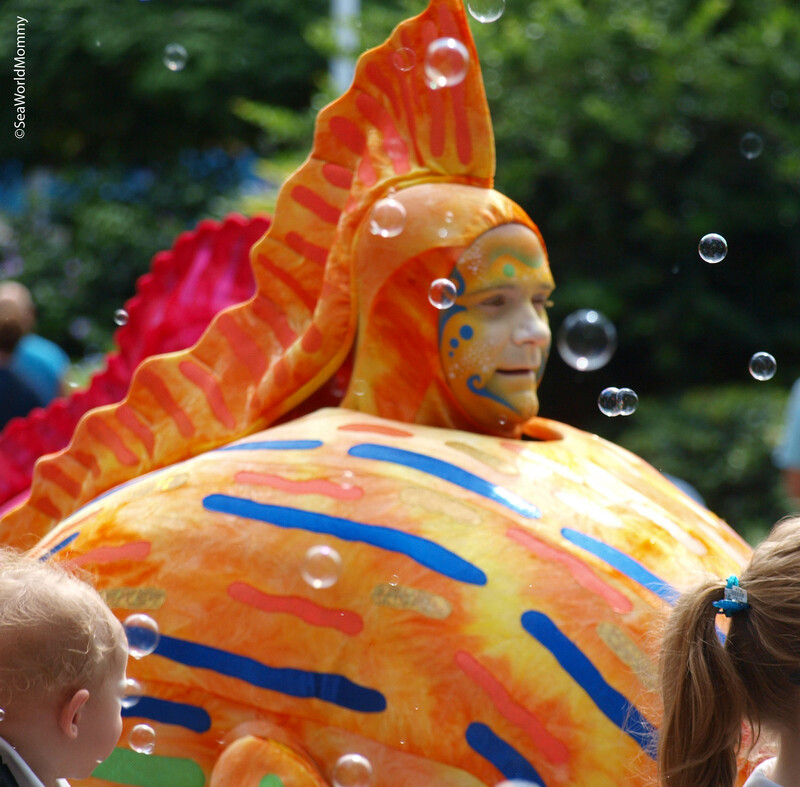 There you’ll find craft stations, bubbles galore, fun music including a live DJ, and the most adorable sea-themed characters you can imagine! Keep that dancing idea going into the night at an hour before closing. 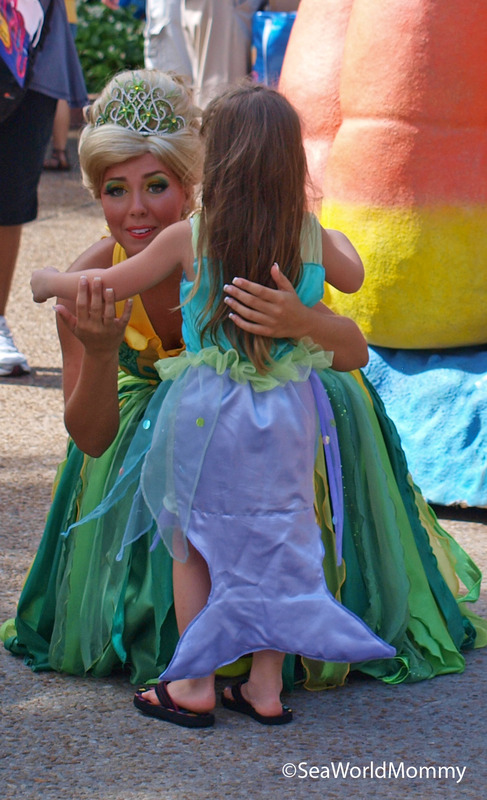 Princess Penelope and all her undersea friends can “get down” in the Village Square at the front of the park. It’s always a blast. 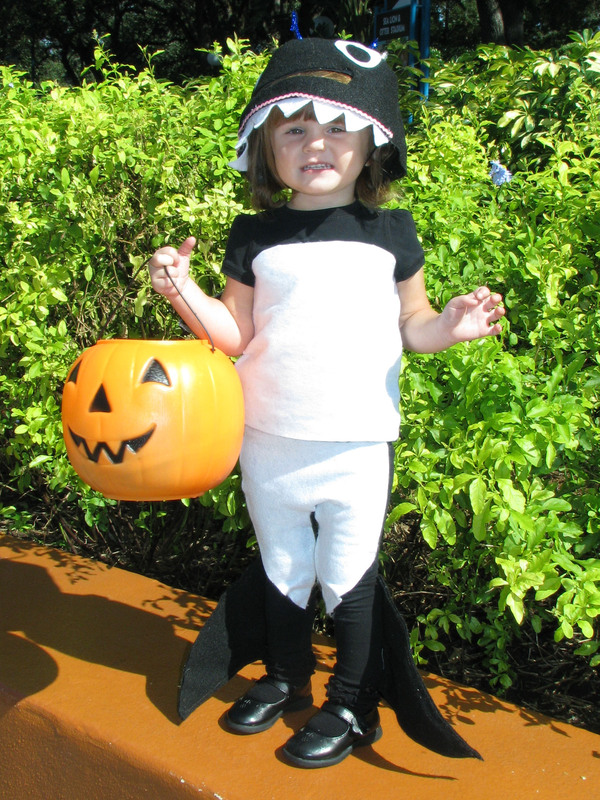 Admission to SeaWorld’s Halloween Spooktacular is included with SeaWorld admission, whether you have a day pass, fun card, or annual pass! 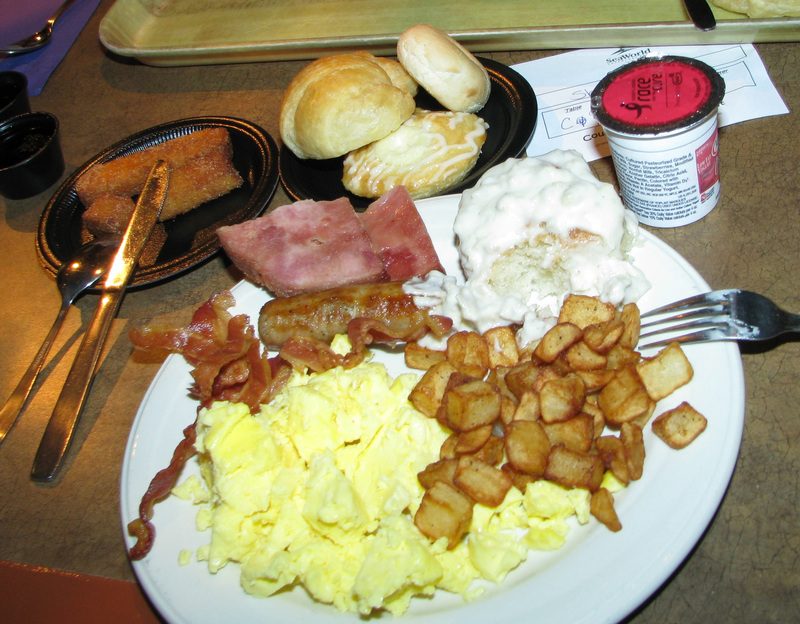 Add-ons include: Sweet Treat Decorating, and the Dine with Shamu Spooktacular Brunch. I can’t wait for tomorrow! 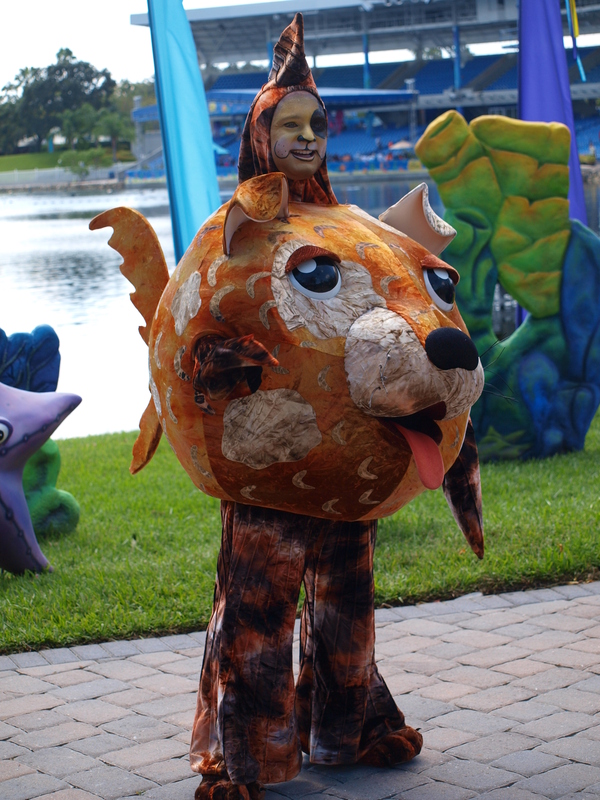 We’ll be at SeaWorld Orlando for Spooktacular… the last weekend of the year! New to this year is Penelope’s Party Zone. It’s a fun nighttime event that is included with admission each weekend evening. 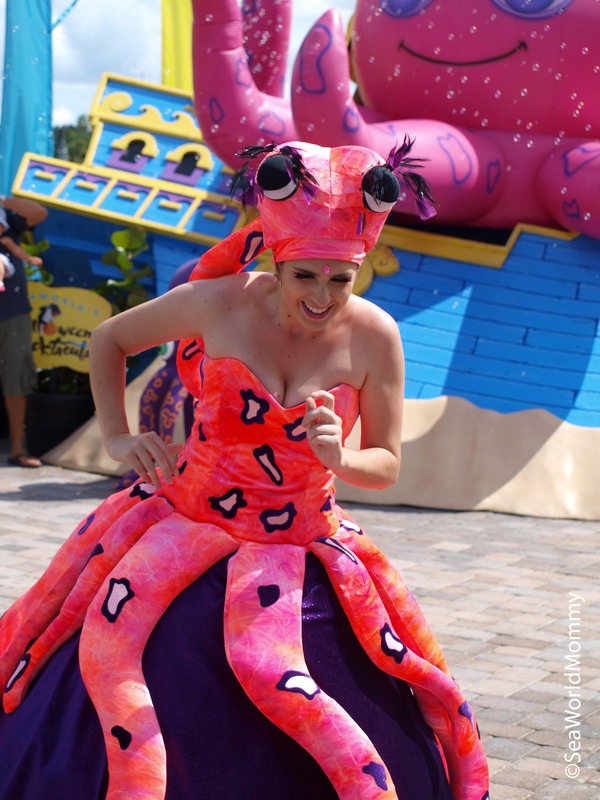 (It’s the reason I LOVE getting annual passes at SeaWorld… all this fun is part of it). See you and all my silly and spooky fun friends this weekend! We’re huge Spooktacular fans. We usually attend every weekend its held (as you may have read here… or here!). Sometimes TWICE in one weekend. It’s that much fun! There you’ll see whimsical witches, jazzy jellyfish, exotic creatures from the deep and in the air, and friendly starfish galore! It may be called “Spook”tacular, but there’s nothing spooky about it. It’s lots of not-scary, no-spooking, just plain fun! Brought back again this year is the very fun Super Starfish of the Day contest! 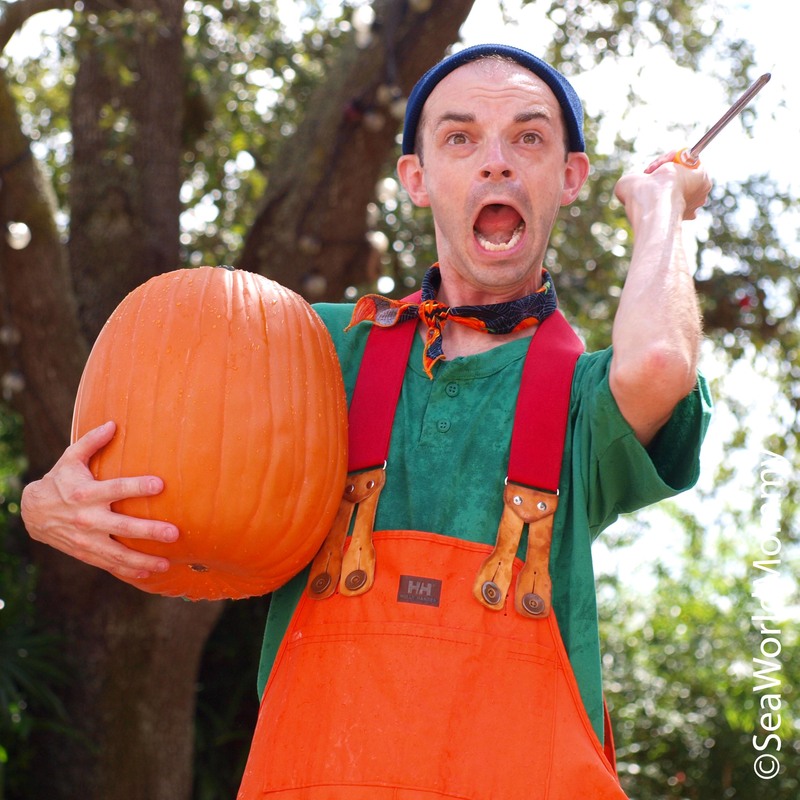 To enter, when you get to the park, post a photo of your kids (or YOU) in costumes at SeaWorld Orlando by noon (weekends only) on their Facebook, Twitter or Instagram pages using the #SeaWorldSpooktacular hashtag. They announce the winner shortly after 12:15 p.m. on the various outlets. 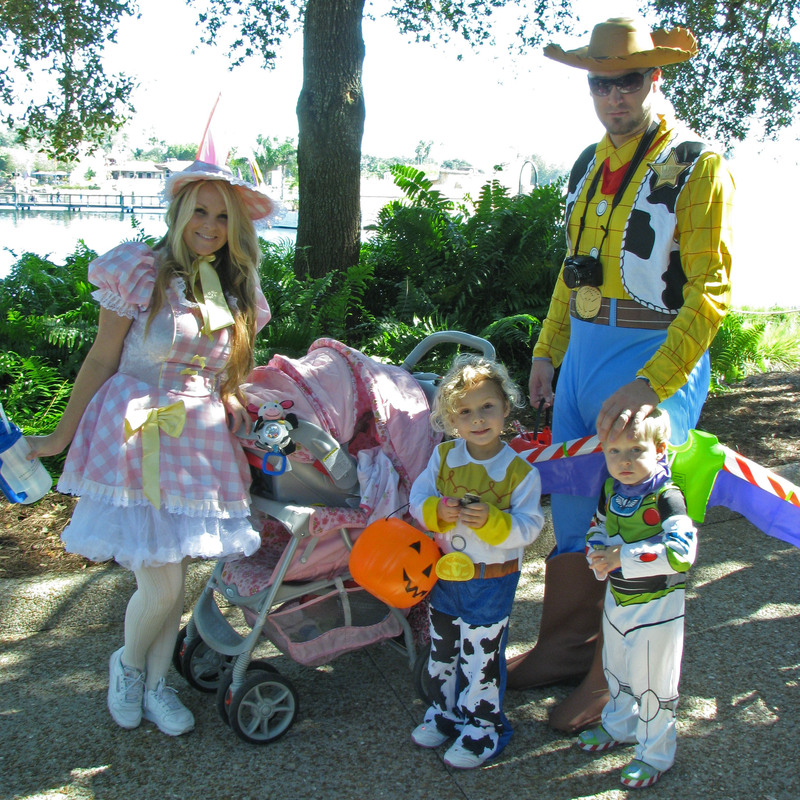 That lucky family then gets Quick Queue passes, all day dining passes for the day, complimentary cookie decorating session at Penelope’s Party Zone, reserved seating at shows, and a complimentary merchandise photo at any location in the park to always remember their Spooktacular day! New this year is the Spooktacular Dance Party. 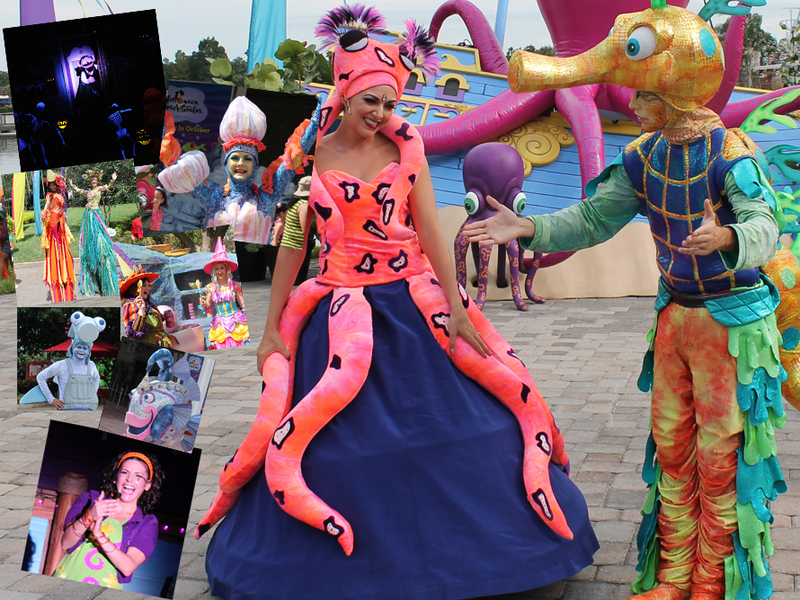 Princess Penelope and her undersea friends (including a dancing Shamu in costume and Daisy Dolphin in HER finest!) dance to such favorites as Monster Mash and the popular dance party fave Gangham Style, LOL. My little man did NOT want to leave, even though he told us more than once he was “soooo tired.” Once he got to the party, though, he got a sudden second wind and was rocking out with the gang amid a cloud of bubbles and characters galore. The rockin’ fun kicks off at 7 p.m. and ends at 8:30 p.m. (although the “soooo tired” kicked in for him FINALLY at 8, so we didn’t quite make last call. Ha!). In the past my little guy had a different costume for every weekend. He’s a little older and this year we’re “saving” the big one for the final weekend and dressing in fall colors or Halloween-type clothing. 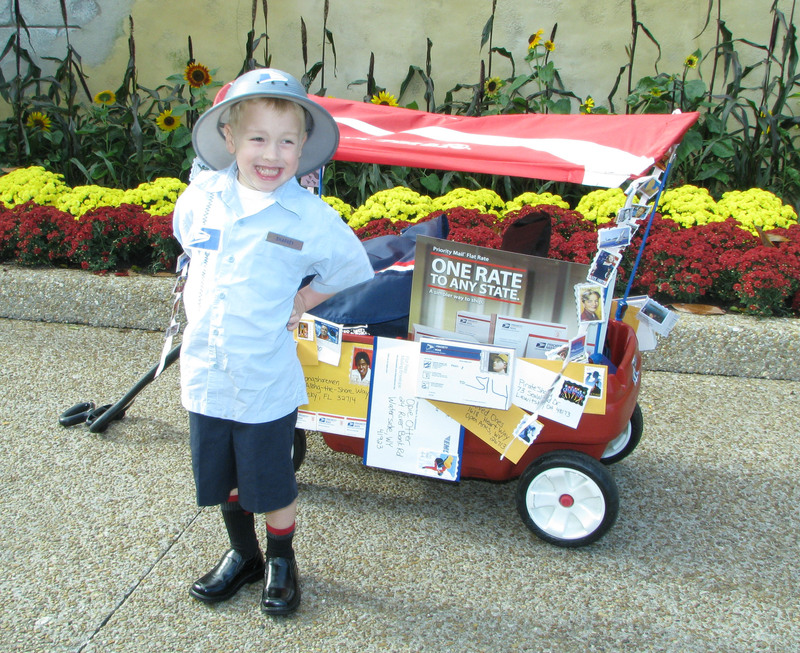 That’s one of the cool things about trick-or-treating there… you don’t have to have a costume (and you don’t have to be a kid… or even HAVE a kid). Best yet, all this fun is included in regular admission. 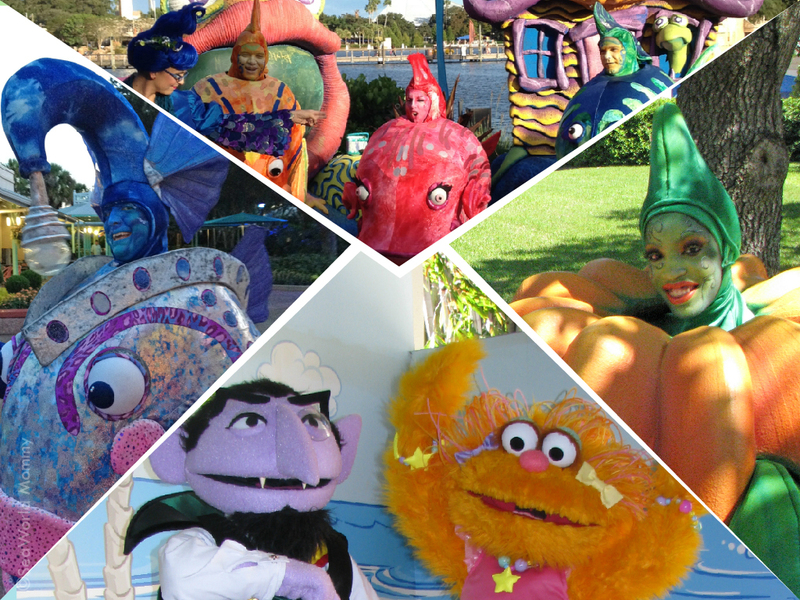 There are no extra fees to attend any of these events (although you can go to to Count von Count’s Spooktacular Breakfast (with awesome photo opportunities with the characters) for an additional fee of $24 for adults and $14 for children (ages 2-9). I’m especially excited to watch Jelly Belly® artist in residence Kristen Cumings as she creates a portrait of a rockhopper penguin from thousands of Jelly Belly jelly beans October 26-27 from 12–8 p.m. inside the craft zone (on the last weekend of Spooktacular) as a tribute to the opening of Antarctica: Empire of the Penguins. 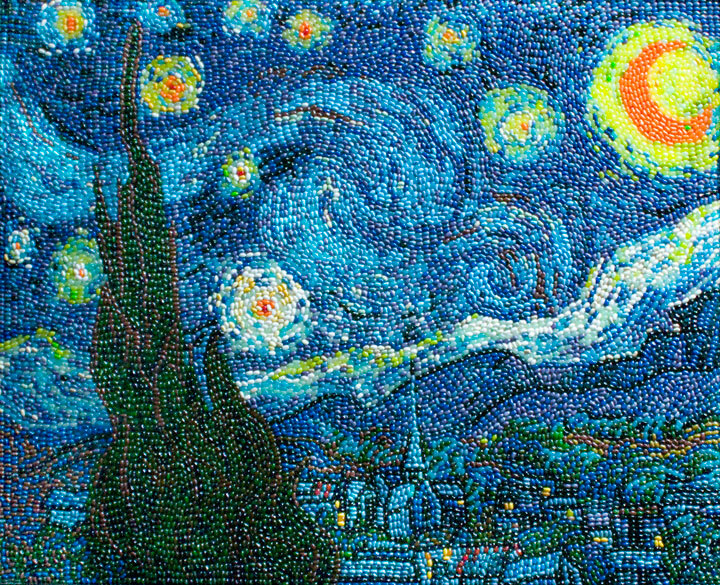 During that time, kids can decorate a Jelly Bean Spooktacular mural as well! 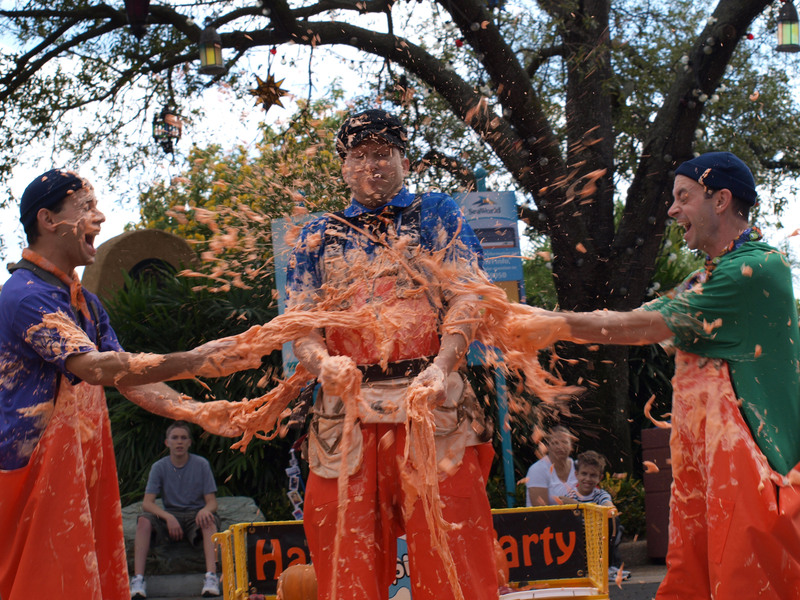 What would SeaWorld Spooktacular be without some Pumpkin Guts!? 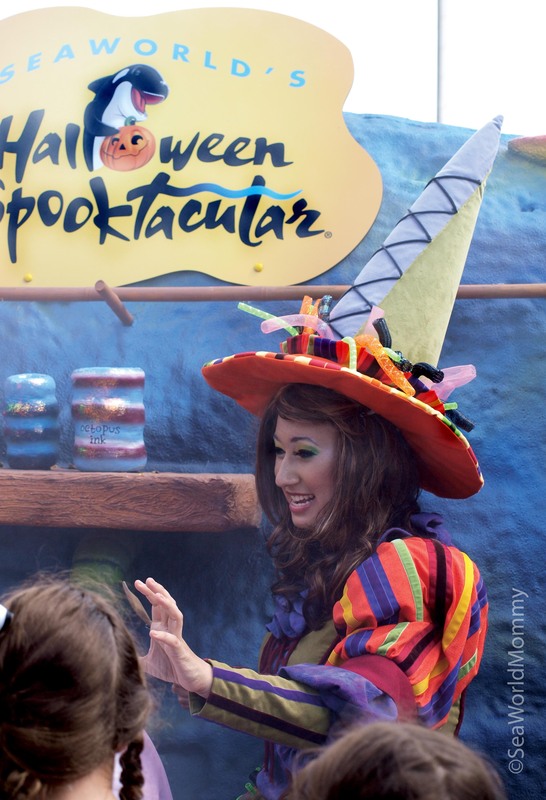 SeaWorld’s Spooktacular ends with two 3-day weekend celebrations this Friday, Saturday and Sunday (October 19, 20, and 21) and wraps up the last weekend of October (26, 27, 28). 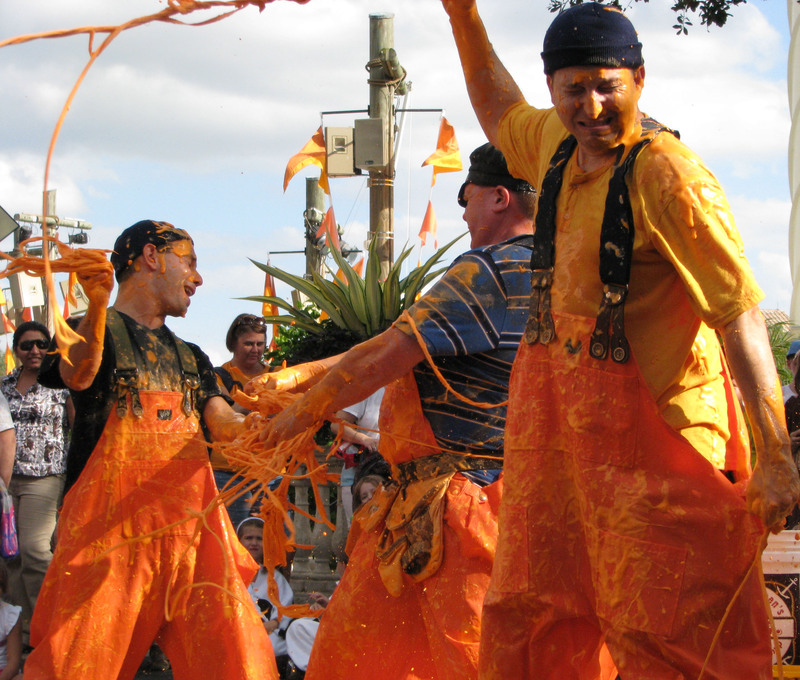 All festivities are from noon to 8 p.m.
near the SEAGarden, you’ll have less traffic. 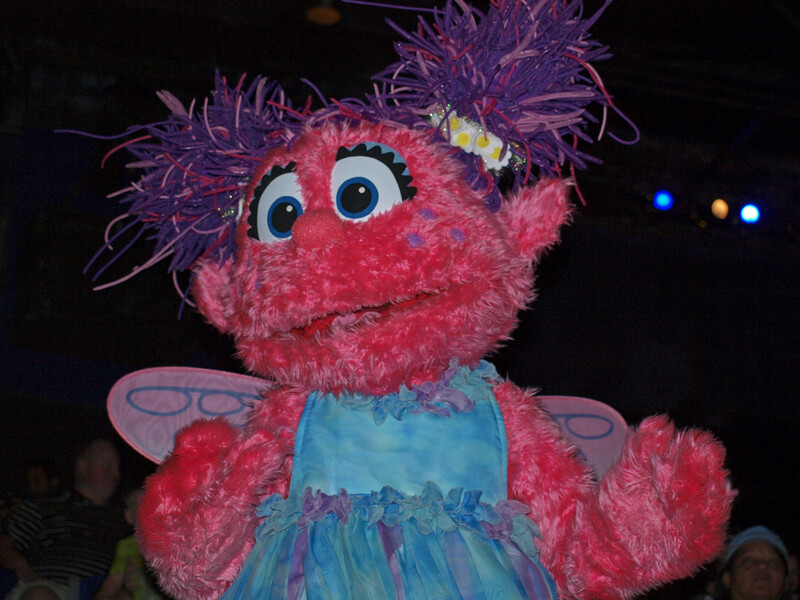 Party — Down in the stage area of Bayside Theater is Penelope’s Party Zone. 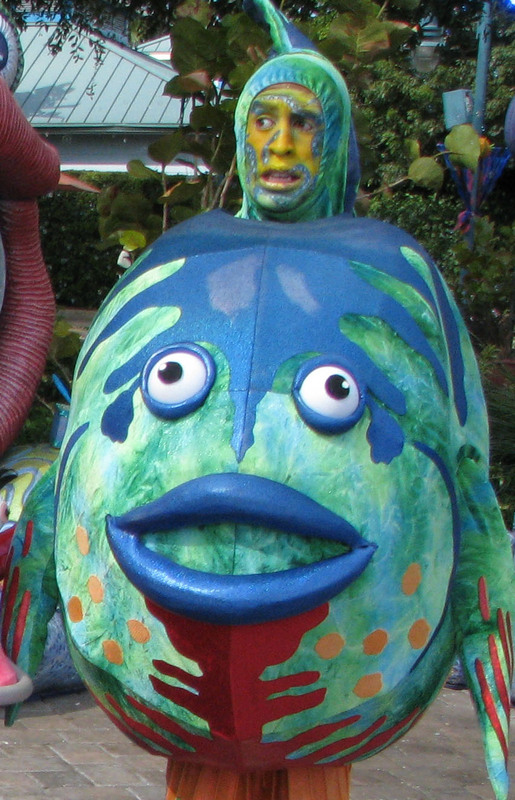 DJs spin kid-friendly tunes while colorful fish and PUMPKIN fish giggle and dance with the kiddos. 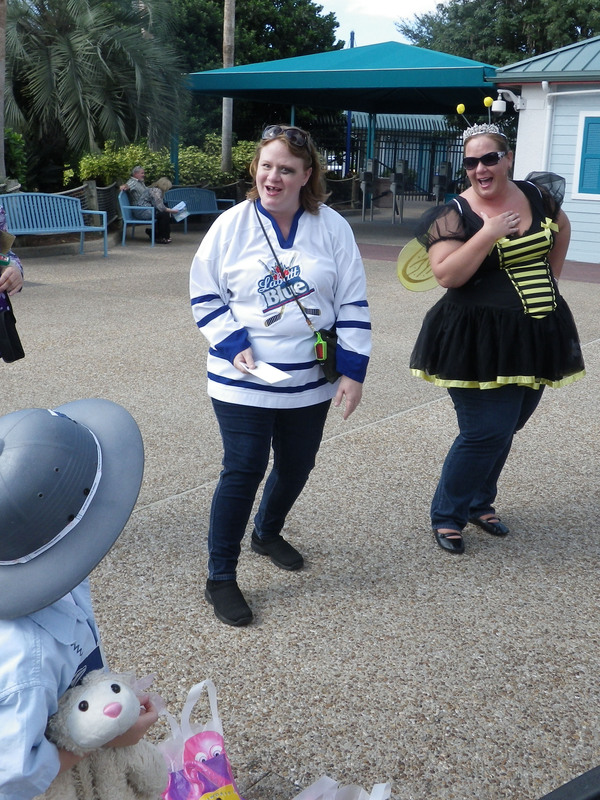 Both Shamu and Daisy Dolphin are on-site for photos in their cool costumes. 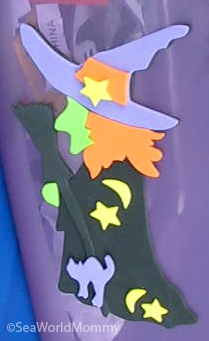 New this year is a free craft table sponsored by Jo-Ann Fabric & Craft Stores where kids can make a foam witch on a broom. Or, if an edible craft is more up your alley, there’s apple and rice cereal treat decorating (for a nominal fee). We’re fans of the apple decorating! Thankfully they had plastic clamshells to bring home our creation. (Can you say “sugar overload”?!) Also in our party lineup is making a sand sculpture. 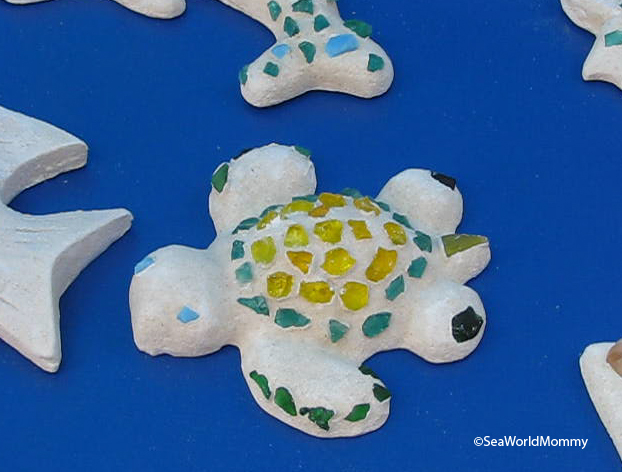 Last year we made a fish and this year, in honor of the new TurtleTrek he made an adorable turtle. The sand activity is $10. Virtual Costume Parade — While you’re near Penelpe’s Party Zone, look for the Photacular station between Bayside Theater and Wild Arctic. 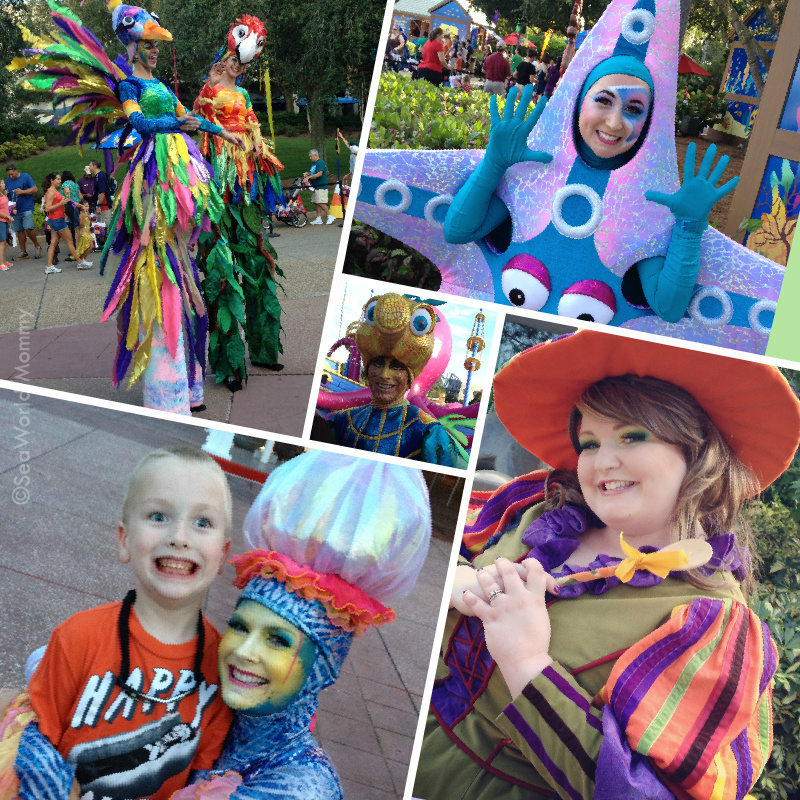 Show off your costume, and it might be part of a pre-show costume parade before the Shamu Rocks show! 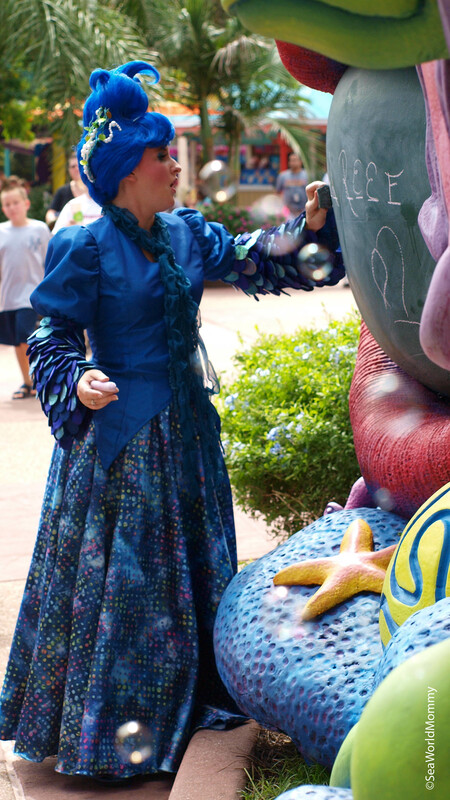 Underwater “Fantasea” — All along the watefront and around the park, you’re sure to run into spectacular characters like the school of fish teacher and her “students.” Play along with their games and shenanigans! Special Shows — In addition to the ever-popular Sesame Street Countdown to Halloween, street performers also have some fun holiday entertainment up their sleeves. 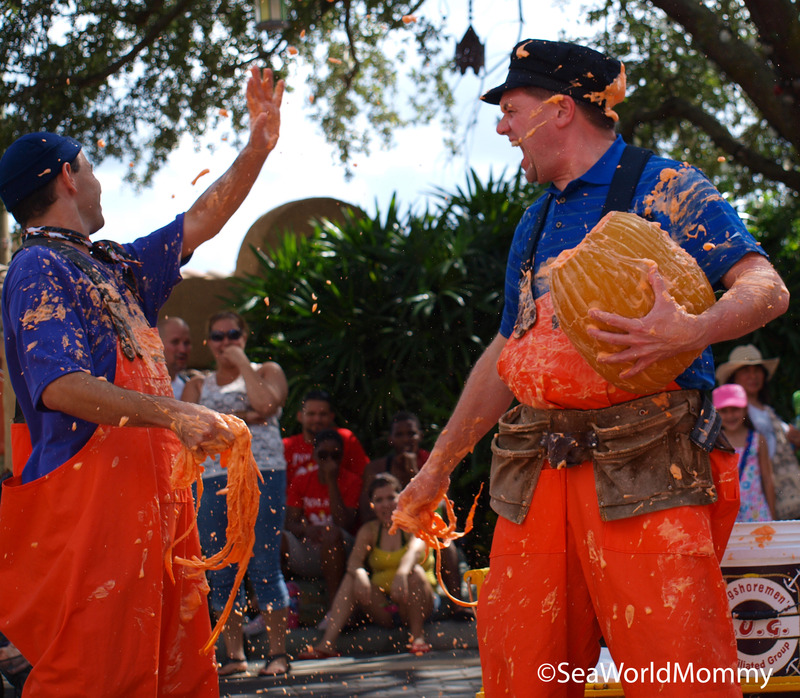 We’re partial to the Longshoremen, a Three Stooges-type live-action routine that, at this time of year, features PUMPKIN GUTS! 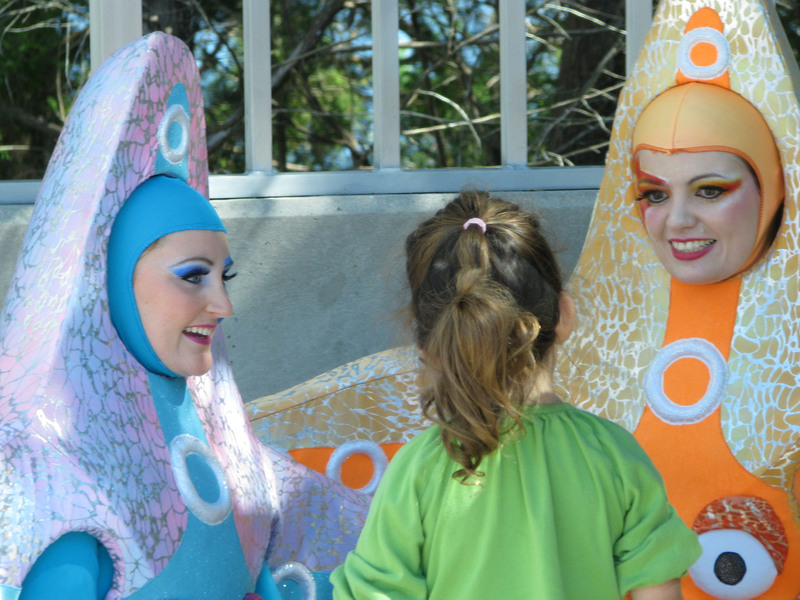 Spooktacular is included in your regular SeaWorld admission ticket price. SEA you there! 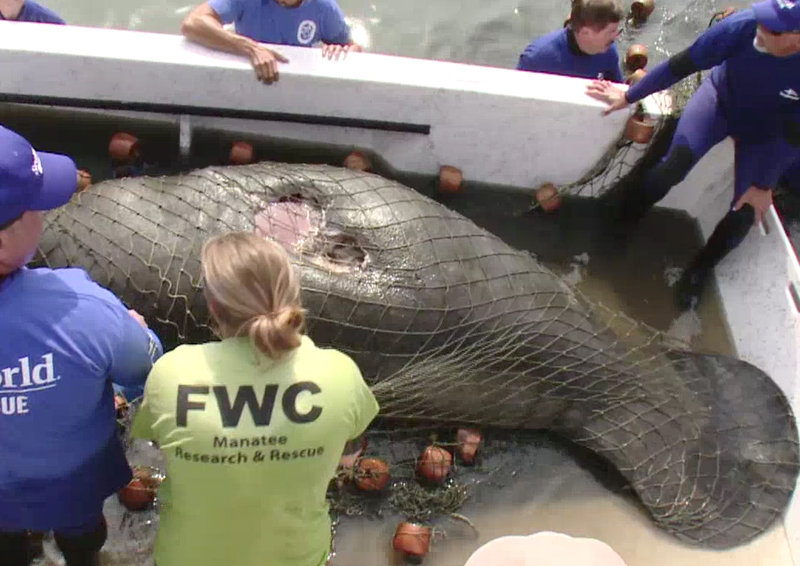 Florida Fish and Wildlife Conservation Commission (FWC) and SeaWorld Orlando animal care specialists load up the severely injured manatee April 10, 2012. The 10-foot female manatee rescued earlier this week in Vero Beach after a severe boat strike is in guarded condition at this time. The Florida Fish and Wildlife Conservation Commission and SeaWorld Orlando veterinarians rescued the 1,700 pound manatee after being notified by a private citizen. She is currently being cared for in the medical pool (part of the rescue/rehab area not visible when visiting the park). This morning animal care specialists gave her antibiotics to help fight infection. SeaWorld’s animal rescue team will continue to watch her progress, ensuring she is eating and is comfortable. Blood work results are not yet back. 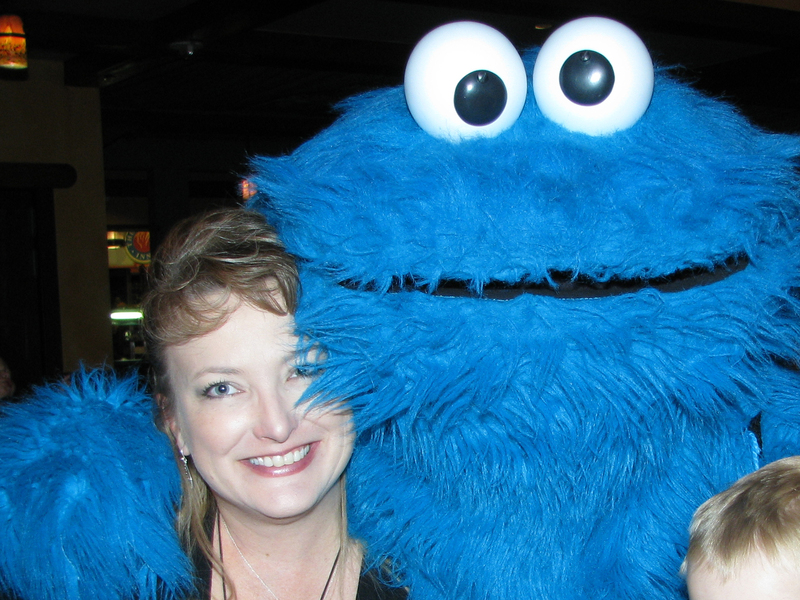 “Count” You In For Lunch with Sesame Street at Busch Gardens? 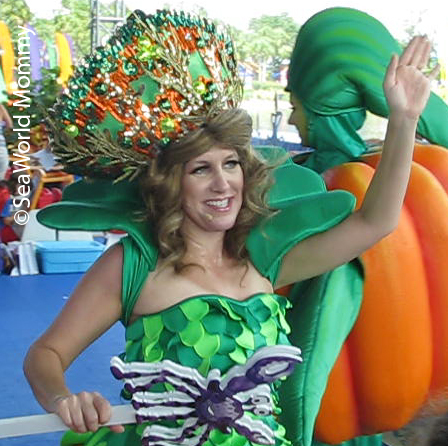 SeaWorld has its very special Spooktacular breakfast throughout October… But Busch Gardens has a Monster Mash Lunch. Only ONE. October 22, 2011. 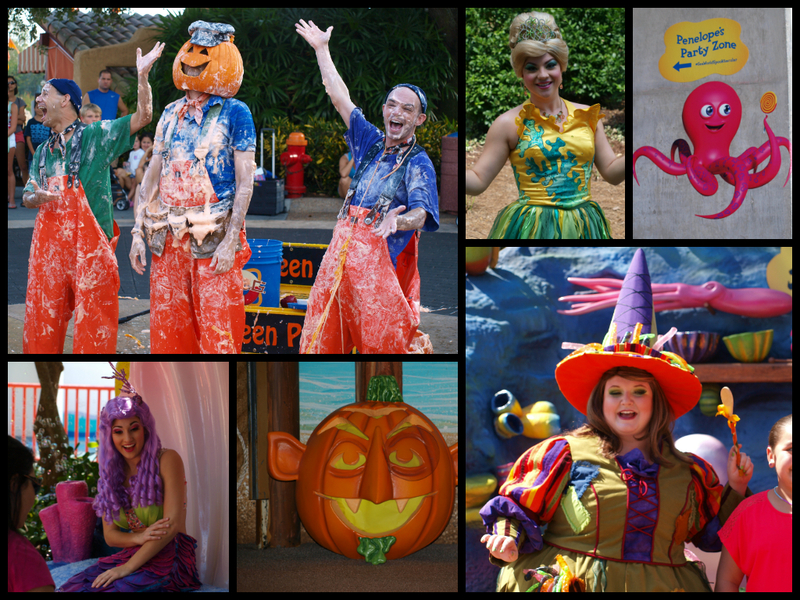 Join the fun at Sesame Street Safari of Fun for the Spooktacular (um, no wait, that one’s taken…) spooky fun lunch. 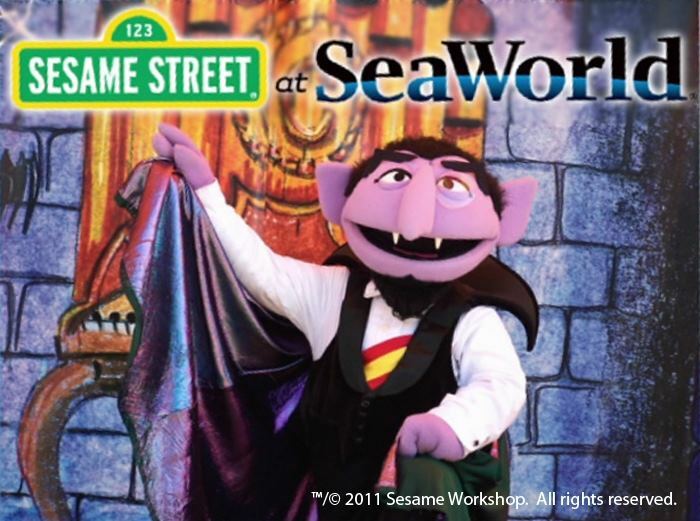 The Count will be making appearances at both SeaWorld AND Busch Gardens! 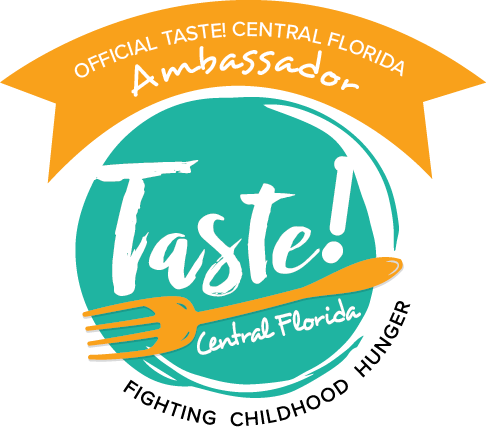 Make reservations at: SesameStreetSafariofFun.com and click on Dine with Elmo to book the Oct. 22 dine, or call 1-888-800-5447. Halloween is, for some, a time to get scared, to play “tricks,” and to dwell on the… shall we say… creepy things of this world… and things other-worldy. (Insert Vincent Price maniacal laugh here.) For me it’s none of those things. It’s about playing dress up, making new friends as you “forage” for candy and other tasty treats, and having an excuse to be just plain silly. Walking down the entrance to the “Spooktaclar walkway” (as we call it), we were greeted by bubbles, bubbles, and more bubbles. For a toddler, this is one spectacular way to be welcomed to the festivities! Whoa. A fish on roller skates just whizzed by us. Or was that sea weed? And a butterfly catcher?! On the way to Abby Cadabby’s maze we pass by dog fish. And catfish. And other assorted creatures of the deep (and some from someone’s fabulous imagination!). Photo opportunities abound, and I took them up on every one! Older kids were not as impressed with the maze as my toddler was, but for his age-group it was perfect. At different way points, Abby’s friends posted signs about which way to go. Parents read aloud and kids answered silly/cute questions. Eventually they reached the finish line and they all, including mine, seemed pleased with themselves. One of the highlights, however, was watching the Longshoremen perform their pumpkin routine. You won’t find their schedule posted on the daily map (rats! 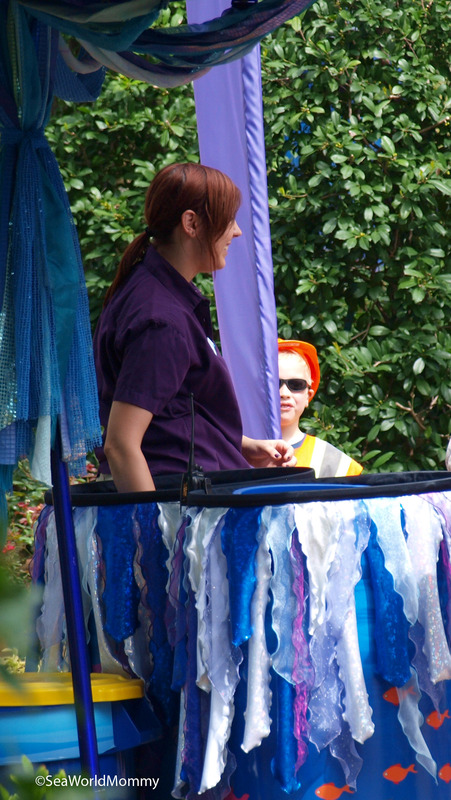 ), but you can find them “along the shore” most afternoons making people laugh. I think we sat down for their show every weekend of the event. FYI: “pumpkin guts” can be made using rope, shaving cream, and a tiny bit of orange tempera paint. Who knew? 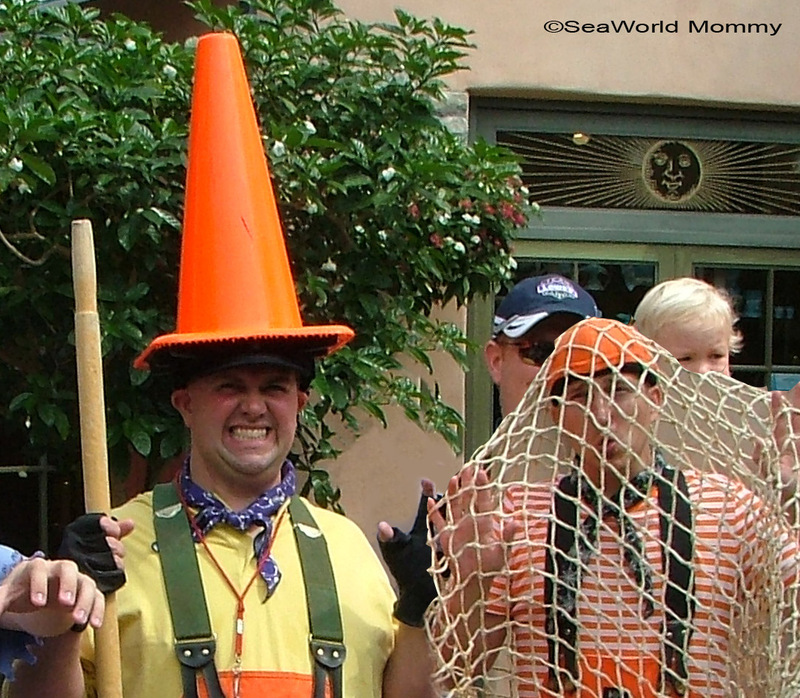 Next stop: Shamu’s Happy Harbor where Penny Penguin, Opie Otter, and other strolling characters show us their costumes. Shamu (the character version!) can also be seen donning a fanciful getup. (Say, I wonder what he’ll be for Halloween this year!) After a few photos, and rides!, we made our way to the Pets Ahoy theater. Seasonally, the fun is changed for a couple of shows a day and the Sesame Street gang, not the pets, are the stars. 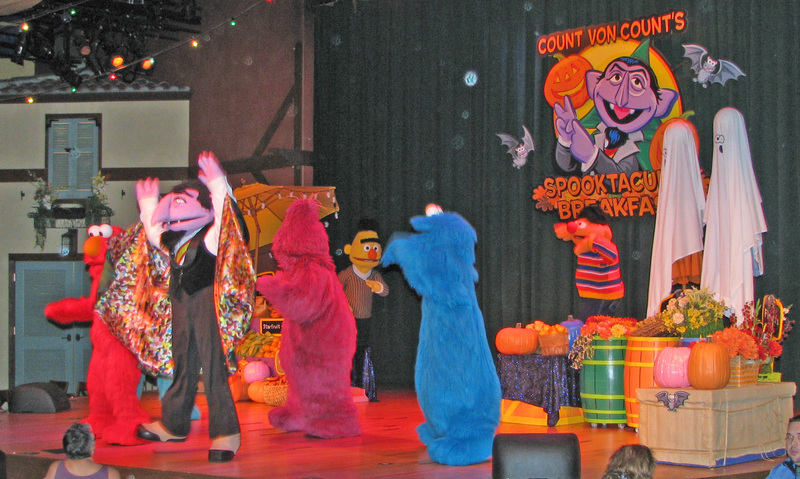 The Count takes over for the “Countdown to Halloween” and delighted fans sing along. OK. Their parents sing along, too. 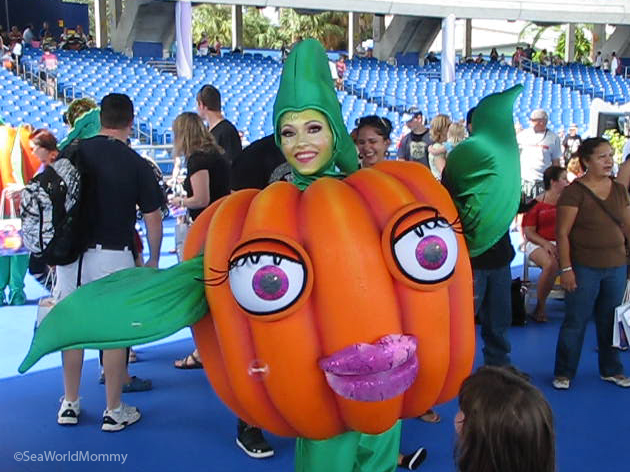 While no frightening laugh track is piped in over loudspeakers and the only things jumping out at you are the dolphins and whales out of the water, SeaWorld’s Halloween Spooktacular is our kind of fall festival. Good, clean fun. Adorable children. Smiles. And pop! More bubbles.